"Tangy and sweet old-fashioned baked beans with a little jalapeno. They're easy to make and great at a BBQ, hamburger night, a picnic, etc. My husband's favorite semi-homemade recipe. Says the sweetness and fire create a super depth of flavor. It's not strong enough to overwhelm the sweet home-style of baked beans." Cook and stir bacon in a large skillet over medium-high heat to render some fat, 2 to 3 minutes. Stir onion into the rendered fat and cook until the bacon is crisp and the onion is tender, 7 to 10 minutes. Stir baked beans, ketchup, brown sugar, Worcestershire sauce, prepared mustard, minced jalapeno pepper, chili powder, and mustard powder together in a large bowl; add bacon mixture and stir. Pour the mixture into a 13x9-inch baking dish. Bake in the preheated oven until the liquid has thickened, 45 to 55 minutes. Chili sauce, chopped bacon, and brown sugar add big flavor to baked beans. Wouldn't change a thing! Absolutely loved these! 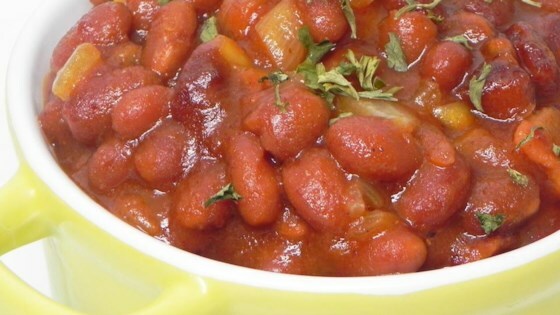 Even guests who said they really don't like baked beans loved this recipe. I followed the recipe exactly. I made absolutely no changes, these were mighty tasty!! A good combo of sweet and spicy together!! Yummy! !